The Windows 10 featured called Quick Access is the easiest way to find the files and folders that you use most often. With Quick Access, you can see up to 10 folders frequently used folders, or the 20 most recently accessed files in the File Explorer window. 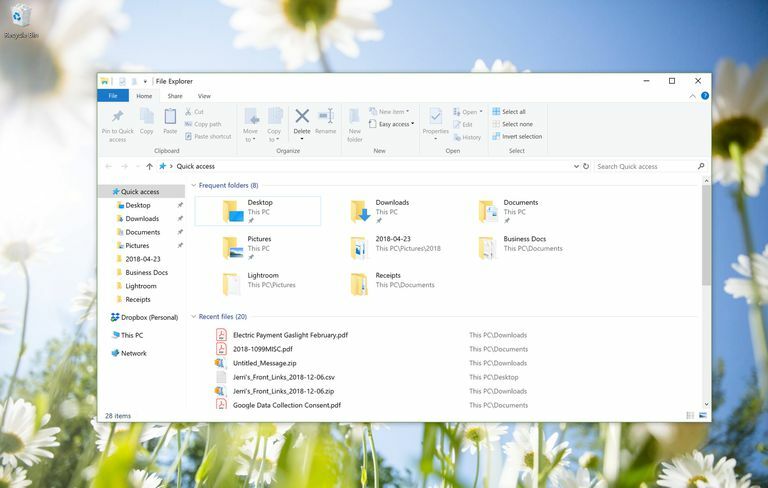 You can also customize the folders that are shown in the Quick Access view, disable Quick Access, or clear your Quick Access history to reset the files that are shown in the window. Quick Access takes the place of the Favorites capability that allowed users to favorite frequently used files or folders to make it easier to find them. By default, Quick Access is enabled in the Windows 10 File Explorer window. Also by default, the folders and files that show in Quick Access are determined by those you use most frequently or recently. You can, however, customize which folders are displayed in Quick Access. You do this by pinning folders to the Quick Access view. Open File Explorer and then navigate to the folder you want to pin to Quick Access. Select the folder and then click the Home tab on the Ribbon. From the menu on the Home tab, click Pin to Quick Access. Alternatively, right click the file and select Pin to Quick Access. You can remove folders from Quick Access just as easily. Right click the file you want to remove and choose Remove from Quick Access. Pinning a file to the Quick Access window or removing a file that was previously pinned to the Quick Access menu won’t change the physical location of the file on your hard drive. If you’re not a fan of Quick Access, you can remove it so that when you open the File Explorer, it opens to This PC which you may recognize as the older Microsoft File Explorer Display that showed My Computer and all connected drives as well as the Desktop folder, Documents, downloads, Music, Pictures, and Videos folders. Open the File Explorer and click the File tab. In the menu that appears, select Change Folder & Search Options. The Folder Options window opens. Then click the dropdown menu next to Open File Explorer and select This PC. In the Folder Options window, under the Privacy section, deselect the option for Show frequently used folders in Quick Access. Once Frequently Used Folders is disabled, you can add your favorite folders by dragging and dropping them into the Folder List. Even if you are comfortable using the Quick Access File Explorer view, you may want to start fresh once in a while. For example, if you finish one project and begin another, but you don’t want to wait for the folders you’re using on the new project to replace the folders you used on the old one, you can reset your Quick Access history. In the menu that appears, select Change folder and search options. Select Clear File Explorer History to clear your previous usage history and start with a clean slate. The File Explorer also has a Quick Access toolbar in the upper right corner of the File Explorer window. By default, the options available in this Quick Access menu are Properties, New Folder, and a configuration menu (shown as a downward pointing arrow). There are some addition options -- such as Undo, Redo, Delete, and Rename -- available that you can add to that menu as well. Open the File Explorer and click the downward pointing error on the Quick Access Toolbar. Click the names of the functions you want to add. Conversely, you can remove items from that toolbar by deselecting them in the same menu. The Quick Access toolbar is different from the older Windows Favorites options in the File Explorer, but once you get control of it and can customize it to the way you work, it makes the files and folders you use most often accessible with just a few clicks of the mouse.